I’m not an artist just a determined craftsman. Self-taught welder, sculptor and designer. I work driving forklifts and thought I’d have a crack at a steel sculpture so a horse’s head seemed like a good idea. I began to relish the solitude when grinding and it seemed the whole world would disappear or at least be too scared to come to close to the sparks. 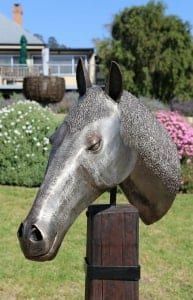 This was my first and possibly last sculpture and really love the reaction to people feeling the head , reminiscing of times gone by when they would run their hands up under a horses jaw etc. I’m 44 live just south of Brisbane and love the bush.